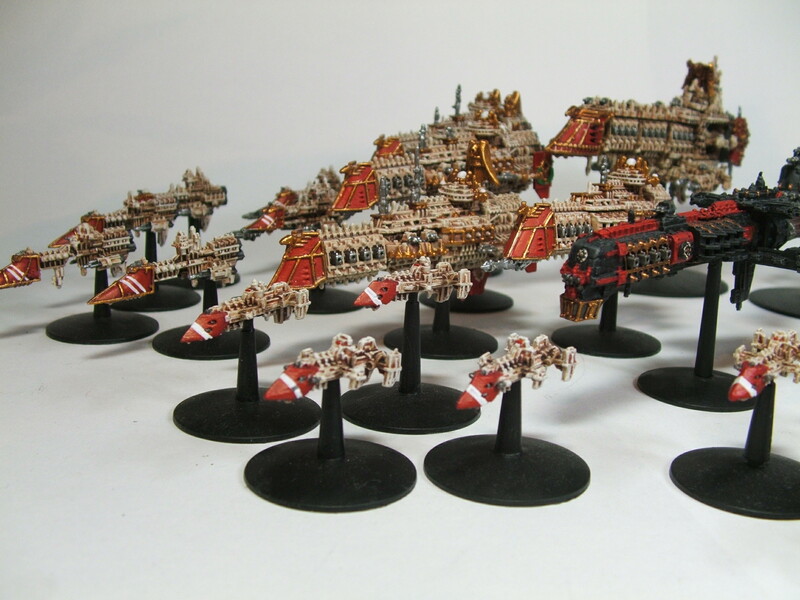 Here’s a gallery of the Imperial Navy fleet I painted up a little while ago for Battlefleet Gothic. Like many people, Star Wars was an integral part of my childhood and I still get a rush of excitement when I see anything with a spaceship in it. I remember White Dwarf (back in the days when it was a hobby magazine) brought out trial rules for space combat and cardboard cutout spaceships in one of their earlier editions and I had hours of fun with those things. I was suitably excited when the actual game came out and immediately bought myself a small fleet. I recently stumbled across them and decided to strip off the old paint job and redo them, and added in a few extra bits and pieces as well. Anyway, here is Battlefleet Eshunna, currently serving in the Badad Sector of Segmentum Ultima. Also, sorry about pic quality. I’ll redo them with a more appropriate black backdrop when I get a chance. Hi! I really like your paint scheme, it is very close to the one found on Bfg box set. How did you achieve that? Which colours did you use? Hi Arrotino, sorry for the late reply! The colour scheme was fairly easy. The models were undercoated white, and then painted bleach bone in the old colours. They were then given a wash of ogryn flesh, and once this had dried, drybrushed bleach bone and then white. The prows were painted khorne red and then mephiston red, and the gold trim was shinning gold. I assume the scheme should still work with the updated paints.